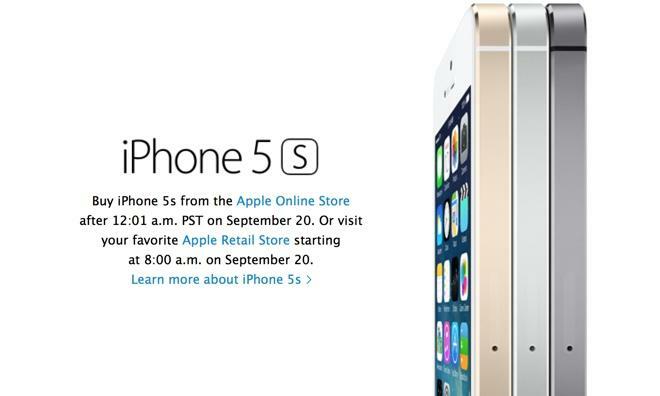 Online iPhone 5s orders open at 12:01 a.m. Pacific Sept. 20, in-store sales begin locally at 8 a.m. While it won't be available to preorder, the iPhone 5s will hit Apple's online store at 12:01 Pacific next Friday, Sept. 20, while Apple's retail stores will begin selling the device when they open at 8 a.m. local time. Apple announced more details on the availability of the iPhone 5s in an email sent out to customers Friday morning. Customers hoping to get the iPhone 5s on its launch day next Friday will presumably need to line up at an Apple Store or one of the company's carrier partners. That's different from the iPhone 5c, as Apple and carriers have just begun taking preorders for the multi-colored handset. Those who order the lower-end device can have it delivered to their home on its launch day next Friday. The lack of preorder availability for the iPhone 5s has led to speculation that inventory could be severely constrained for the upcoming launch weekend. In previous years, users were able to preorder Apple's latest flagship handset ahead of time, and available inventory sold out in a matter of minutes. Well-connected analyst Ming-chi Kuo of KGI Securities revealed last month that the iPhone 5c would out-ship the iPhone 5s in the current quarter. According to Kuo, the iPhone 5s has faced apparent production issues associated with the new Touch ID fingerprint scanner located under the home button. Apple is reportedly on track to ship 8.4 million iPhone 5c units in the September quarter, but just 5.2 million iPhone 5s units. As production ramps up, Kuo expects Apple to grow iPhone 5s shipments to 28 million units in the holiday 2013 quarter, while the iPhone 5c will reach 18.7 million units during that three-month frame.